Two photographs showing members of the Grand Army of the Republic (G.A.R.) in Harveyville, Kansas. 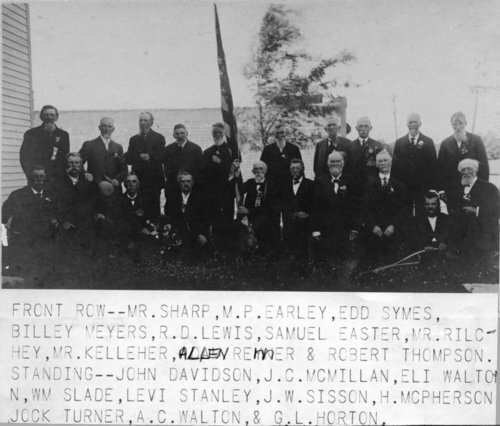 Members are identified as Mr. Sharp, Moses P. Earley, Edd Symes, Billey Meyers, R. D. Lewis, Samuel Easter, Mr. Rilchey, Mr. Kelleher (or Kellier), Allen Remer, Robert Thompson, John Davidson, J. C. McMillan, Eli Walton, William Slade, Levi Stanley, J. W. Sisson, H. McPherson, Jock Turner, A. C. Walton, George L. Horton, E. H. McMillan, Ed Purnell, and Mr. Cox.